Finally some nice weather – albeit quite chilly – but all this sunshine has got me designing Easter products which I am hoping to put into my Etsy and Folksy shops soon. This, amongst other things, so read on for this latest update at The Old Friendship. 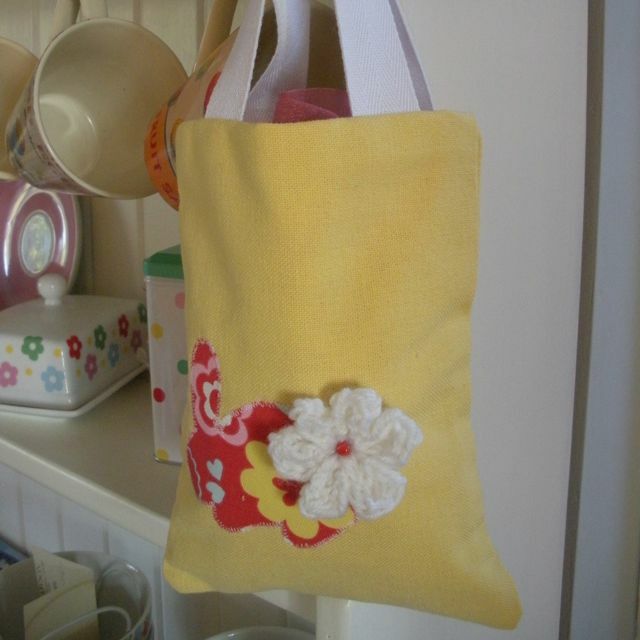 There seems to be a lot of “simple” craft ideas around at the moment – looking at a basic product but designing it in a simple, yet beautiful way, or producing a fabric design which brightens up an existing idea. 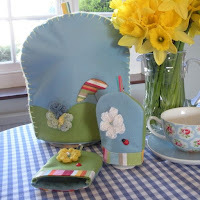 I have really tried to emulate this with my felt caffetiere cosy and matching egg cup holders, to try to capture a bit of that sunshine and make something which is both useful and would make a lovely Easter gift. The cosy is lined in a baby blue plain fabric and each of the egg cosies are blue on one side and green on the other. Applique on the Caffetiere cosy depicts a parasol and deckchair and I have crocheted flowers to add a three-dimensional element. These were great fun to make and, although fairly time consuming, can easily be replicated if anyone wanted a set with a different picture on, or in different colours. My boys have been going on at me since I made a laptop case for my computer back in December, so I thought it would be a good idea to make something for them. 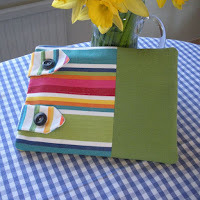 One has an iPad and the other a Notebook and along with hubby’s Kindle, that made three cases to perfect. Many measurements and trials in lining later, I came up with these designs – and even if I say so myself, I am quite proud of them. They are much more interesting than the ones you buy in the shops and will protect said electrical item, especially for travelling or keeping in the car on a long journey. They have been fully lined and interlined with wadding to act as further protection. 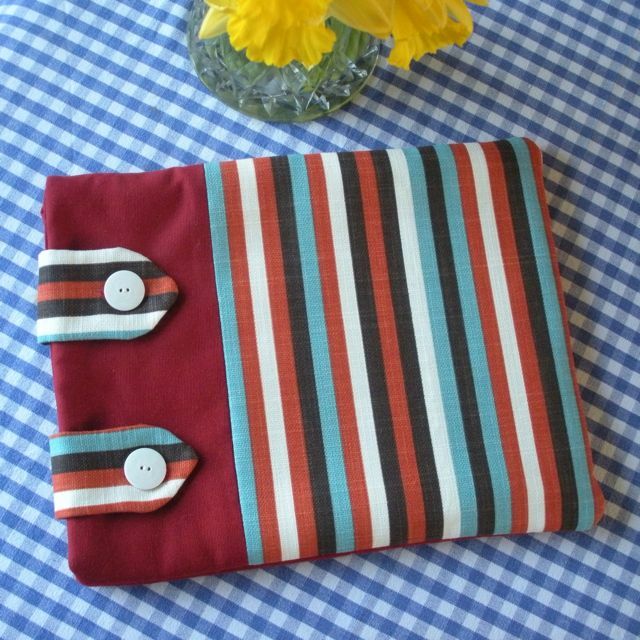 The fabrics would suit both male and female and, as before, I can make these to order, depending on the size of your PC, Mac, iPad, Kindle or Notebook. I really wanted to make some smaller items which could be used for Easter gifts, so came up with these gorgeous lined bags with a jaunty Easter Bunny complete with crocheted tail. I think they would look great on Easter Sunday, whilst hunting around the garden for eggs and can be kept for years to come. We are off to London for the weekend tomorrow and I am going to see a production of Season’s Greetings at the National Theatre on Saturday with a friend of mine. Hubby is in charge of children and is planning at trip to the O2 to see dinosaurs. Sounds interesting! Next week sees a busy time again in the workshop with at least two pairs of curtains to make, so it’s just as well I got all my Easter gifts made this week, otherwise we would be missing Easter and heading towards Summer before I got the chance to catch up! Have a great weekend everyone, and look forward to seeing you again soon on the Old Friendship blog. If you enjoy what you read then feel free to follow my blog by clicking on the links at the top of the page. If you would like to post a comment, then please do – I would really like feedback on anything I write or show you. Alternatively feel free to follow me on Facebook or Twitter if you prefer! Blogging for Dummies and Blog Roll!